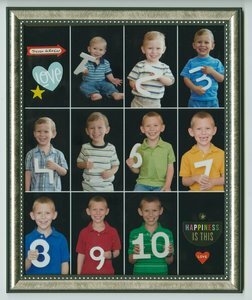 Awhile back, I shared with you how I used PicMonkey to change a photo background and create an awesome collage of Trevor's birthday photos. As a Christmas gift for myself, I printed the collage as an 8x10, added stickers, and popped it in a frame. I absolutely love it. Trevor says that I can keep making these every ten years. He's still at that adorable age where he thinks he'll live with us forever and that of course he'll cooperate for birthday portraits and hold up numbers for the rest of his life. I hope so, but I'll settle for cooperation through age 18! I love this! Clever idea, and it turned out great.